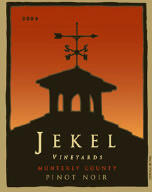 The Jekel Vineyards Monterey County Pinot Noir carries the theme of value Pinot Noir quite proudly. Bill Jekel , who founded Jekel Vineyards in 1972, was a tireless advocate for the potential of Monterey County to produce world-class wines. Now owned by Brown-Forman, Jekel Vineyards has a really credible 2005 Pinot Noir made in large quantities and readily affordable. The winemaker, Charlie Gilmore, sources from Jekel's Gravelstone Vineyard with some Sonoma Coast fruit added in.